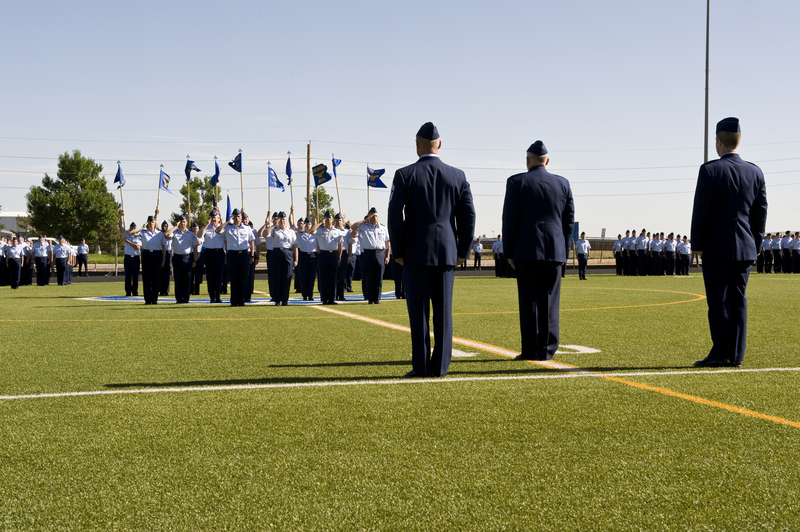 As the 460th Space Wing at Buckley Air Force Base, Colo., said farewell to Col. Dan Dant and welcomed Col. Daniel Wright III as the new commander, the military tradition of “pass in review” was upheld during the ceremony. Senior Airman Marcy Glass writes that the tradition of “pass in review” has roots that date back to Alexander the Great. He would walk the lines inspecting his troops before going into battle. “The traditional ceremony of ‘pass in review’ evolved at Valley Forge, Pa., during the Revolutionary War. Baron Friedrich Von Steuben volunteered his services to the Continental Congress and was assigned to serve under Gen. George Washington at Valley Forge. Washington appointed Steuben as the inspector general, and he oversaw the training and discipline of the Continental Army. “With 100 men selected as a test group, Steuben instructed and trained the men in drill, maneuver and a simplified manual of arms. All training was done in full military dress uniform. He introduced a system of progressive training including the school of the soldier, with and without arms, and the school of the regiment. These schools taught the basics of soldiering such as marching, drill, firing and bayonet procedures, discipline, and charges of each rank. “After Steuben’s remodeling of the test group was completed, the 100 men went to each brigade teaching other soldiers. Eventually this training spread like wildfire, and the results of the new Continental Army’s training showed at Barren Hill, Pa.
“Over the next 236 years, the traditions created by Steuben have been practiced by all the military branches and has become more ceremonial.